Because Eugene Lazowski was a doctor, he believed he should not kill. He would not even shoulder a rifle. But he also could not stand by while other good and innocent people were killed. And so when the Nazis overran Poland in World War II, Lazowski yearned to find a way to fight back, to protect human life, and he seized upon a paradoxical instrument of salvation--the German army's profound fear of disease. While German industrialist Oskar Schindler, whose heroic story was told in the movie "Schindler's List," employed bribes and influence to protect as many as 1,000 Jews who worked in his factory, Lazowski slyly used medical science to save the lives of thousands of Jews and other Poles in 12 Polish villages. He and a fellow physician, Stanislaw Matulewicz, faked a typhus epidemic that forced the German army to quarantine the villages. Thanks to that quarantine, many of the villages' 8,000 men, women and children likely were spared the fate of being deported to prisons, slave labor camps or death camps, where Poland lost a fifth of its population. "He's why I became a doctor," one of those villagers, Jan Hryniewiezki, says today about Lazowski. "He was a patriotic hero because he wasn't afraid to do what he did during very bad times." For decades after the war, Lazowski's and Matulewicz's audacious actions went unheralded and were almost forgotten. 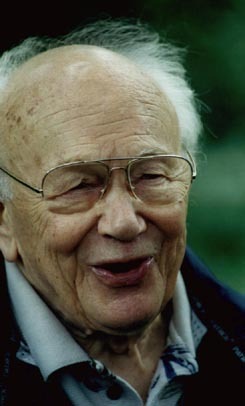 Lazowski, his wife and their daughter immigrated to Chicago in 1958, where he became a professor of medicine at the University of Illinois Medical Center. Matulewicz resettled in Zaire, where he became a professor of radiology. He now is retired in Poland. But eight years ago, the two doctors finally got around to writing a book, in Polish, about their exploits. Private War became a best seller and made them heroes in Poland. And now a young documentary filmmaker from north suburban Bannockburn, Ryan Banks, is completing a film about the doctors' exploits that he hopes will also make them celebrated figures here. Not that the doctors much care. They say they just did what doctors should do. "The basic duty of a physician is to preserve life," Lazowski explained, "and this was a way of saving lives." 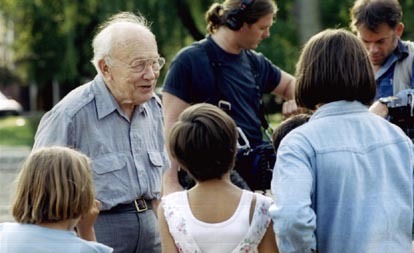 In German-occupied Poland in 1942, Lazowski was a 29-year-old doctor, somewhat soft-spoken, working for the Polish Red Cross in the tiny village of Rozwadow. The Gestapo was terrorizing the countryside--committing random murders, seizing young Polish men and women to work as slave laborers, and dispatching Jews to death camps. Lazowski was deeply distressed. As a doctor, he felt he could not pick up a weapon and kill another man. But as a Polish patriot and man of conscience, he could not stand by and do nothing. So when a fellow doctor, Matulewicz, told him he had discovered a way to make healthy people test positive for typhus, Lazowski was delighted--and immediately knew what his role in the war would be. "I was not able to fight with a gun or a sword," he said, "but I found a way to scare the Germans." Typhus is an infectious disease spread by body lice that is often fatal, and at that time there was no cure and vaccinations were scarce. The German army dreaded the disease because in unsanitary wartime conditions, it could race through a regiment. So doctors who suspected that a patient had typhus were required to submit blood samples to German-controlled laboratories for testing. Jews who tested positive were shot and their houses burned. Non-Jews were quarantined or sent to special hospitals. Matulewicz desperately wanted to bypass the German labs. He dared not send the labs blood samples from Jewish patients--it would mean their deaths. He had to figure out a way to perform the typhus test on his own. "It was very important for us to make a final diagnosis for people who were hiding from the Germans or who were Jews because it could be very dangerous to send their blood for examination," Lazowski explained. The accepted test for typhus at that time consisted of mixing a certain strain of killed bacteria with a blood sample from the patient. Under proper laboratory conditions, if the patient had typhus, the blood sample would turn cloudy. Matulewicz did manage to devise a way to do the test on his own, and in the process he stumbled upon a curious discovery--if a healthy person were injected with the bacteria, that person would suffer no harm but would test positive for typhus. When Matulewicz told Lazowski of his discovery, Lazowski immediately proposed that the two doctors secretly create a fake typhus epidemic to frighten the Germans into quarantining the area. A typhus scare could hold off the German army as effectively as a line of tanks. From that day on, Lazowski and Matulewicz injected the killed bacteria into every non-Jewish patient who suffered from a fever or exhibited other typhuslike symptoms. They sent blood samples from the patients to the German-controlled lab. And, sure enough, every patient tested positive for typhus. So as not to draw suspicion to themselves, the two doctors referred many of their patients--after injecting them with the bacteria--to other doctors who weren't in on the ruse. These doctors would "discover" the typhus on their own and report it separately. Better yet, when a patient really did have typhus, Lazowski and Matulewicz publicized the case as much as possible--but only if the patient was not Jewish. Within a few months, the Germans became alarmed. One by one, "Achtung, Fleckfieber!" (Warning, Typhus!) signs went up in surrounding villages, until a dozen towns with a total of about 8,000 people were under quarantine. The deportation of workers to Germany from these areas was stopped. German troops kept their distance. Villagers began to feel more relaxed. And only Lazowski and Matulewicz knew there was no epidemic. They told no one, not even their wives. "I was scared, of course," Lazowski said. "I didn't know if I would be arrested and tortured by the Gestapo. So I carried a cyanide pill in case I was arrested." Hryniewiezki, who was just a boy of 15 at the time, says he remembers the shots the doctors gave, the epidemic and the quarantines. He also remembers, he says, that after a while, people figured out what was going on. "When people were getting better, they realized that it was phony," he said in a phone interview from Poland. "But, of course, no one said a word because they knew the Germans would kill them and kill Dr. Lazowski." Hryniewiezki, who is now a surgeon in the Polish town of Poznan, added, "He saved lots of people who would have gone to jail or to labor camps in Germany or death camps." But if no one publicly raised doubts about the epidemic, they quietly wondered why nobody was dying. "If someone asked me why he recovered so quickly from such a serious disease, I just told him he was a lucky man," Lazowski said. Lazowski's fake epidemic came too late for the Jews of Rozwadow, the town where he practiced. The Jews there were rounded up and deported to labor and death camps before the quarantine. But Lazowski's sleight of hand undoubtedly saved many other Jews--although it is impossible to say how many--who were hiding in the countryside or living in the other quarantined towns. At the start of the occupation, Jews accounted for at least 10 percent of the area's population, and that percentage may have grown as Jews fled the big cities for the countryside. Even before he created the fake typhus epidemic, Lazowski was active in the underground Polish resistance, supplying information, medical care, medicine and bandages to bands of saboteurs and guerrillas hiding in the woods. The rear fence of his home backed up to the Jewish ghetto in Rozwadow, and he sneaked in at night to treat patients there. The German authorities demanded a careful accounting of all the drugs and supplies Lazowski used, but here again he managed to fool them. Since his office was close to the town's railroad station, he often was called upon to treat patients who were just traveling through. In his official reports, Lazowski would overstate the amount of drugs and supplies he used in treating these traveling patients, knowing the Germans would have a tough time finding him out. But by late 1943, some among the German top brass began to suspect something was wrong. Polish collaborators had tipped them to the fact that no one seemed to be dying from this epidemic. "The chief of the Gestapo was watching me because he was sure that something was going on," Lazowski recalled. "But I was also a kind of hero to the Germans because I was a young doctor who was not afraid to be infected, so they needed me. But still they thought something was fishy." The local Gestapo chief notified the health authorities, who in turn dispatched an investigative commission and two carloads of soldiers to the quarantined area. Lazowski was ready for them. He lined up the oldest, sickest and most unhealthy-looking people he could find, all of whom had been injected with the fake typhus. He had them wait in filthy huts. Then he had the town put on a big party for the visitors. The vodka flowed, music played and many kielbasa sausages were consumed. "We thanked them for coming and put on a great reception," Lazowski said. "They were having such a good time they sent the younger doctors to make the examinations. I told them to be my guest and examine the patients, but to be careful because the Polish are dirty and full of lice, which transfer typhus." To Lazowski's relief, the young doctors rushed through the exams and only took blood samples from a few subjects without checking for actual symptoms of the disease. When the blood samples later tested positive for typhus, Lazowski heard nothing more from German health authorities for the rest of the war. In the waning days of the war, with the Russian army looming just across the river, the Germans panicked and began to flee. A young military policeman whom Lazowski had secretly treated for venereal disease roared up to his office on a motorcycle. "Doctor, run, you are on the Gestapo hit list," the policeman said. When Lazowski protested that he had been loyal to the Germans, the policeman smiled and named a specific date and place where Lazowski had been seen treating members of the Underground. "So they knew about me," Lazowski said, flashing a smile at the memory, "but they didn't kill me because I was needed to fight the typhus epidemic." Lazowski continued to live in Poland, under communist rule, until his move to Chicago in 1958. But fearing retaliation from former Polish collaborators, he kept quiet about the "epidemic" until he came here. Only then did he confide everything to his wife, Murka, whom he had married at the beginning of the war. Murka, who died in 1996, was not completely shocked. She knew he had worked with the Polish Underground. He had, in fact, frequently traded messages with someone code-named "Pliszka." After they were married, Murka told him: She was Pliszka. Lazowski, now 87, returned to his hometown in Poland for the first time just last fall, invited to take part in a wartime reunion. He received a hero's welcome. People came from all over Poland and Europe to greet him. Ordinary men and women stopped him on the street to say thank you. Lazowski nodded and smiled and shook hands, but he didn't always know what to say. "I felt very uncomfortable," he said. "I was just trying to do something for my people. My profession is to save lives and prevent death. I was fighting for life."